Philadelphia, PA: PRTC devoured the Allstate Hot Chocolate 15 and 5k on Saturday morning. The team was led by an outstanding performance by Christy Cohick. She won the race in 58:51 (6:07 pace) breaking through the finish line tape with a big smile. Kylie Pearse followed for 5th with 58:34. This nearly tied her last appearance at the race in 2017. We're excited to next see her at the NJ Marathon in a few short weeks. On the men's side, Sean Clark and Josh Hibbs went 2/3 to first place finisher Landon Peacock. Sean's 47:52 (5:09/mile) marks another very quality race after his recent half marathon PR. He looks set for a fast time at Broad Street. Josh Hibbs placed 3rd with a 48:04. He paced the race as a "controlled tempo" as he continues to train for the upcoming Grandma's Marathon. David Choi returned to the roads after his great 5k performance on the track last week. He placed 5th with a 51:25. Alex Tozzo repped PRTC in the 5k. His 19:17 marked his best effort in the distance so far this year topping his 19:59 at Adrenaline. Great job everyone! Princeton, NJ: The club continued to take advantage of the beautiful weather on Saturday by stepping on the track at Princeton for the Sam Howell Invitational. Dylan Gearinger made his debut in the 3,000 meter steeplechase. He ran very well on limited hurdle drills (and admittedly, technique) racing his way to a 3rd club record! Dylan's 9:13.23 outdistanced Carmine Gentille's 10:13.67 (also set at Princeton). Dylan next returns to the track for a big 5k at the Penn Relays! Chris Hatler paced the seeded heat of the 1500m. He pulled the group through with expert precision (and prompted speculation among fans that he'd finish the race). Chris is set to race the mile on Saturday at the Penn Relays. Later in the night Kevin Brandon took on the 10k alongside Alex Predhome and Chris Mateer. The latter two runners ultimately stepped off the track before the conclusion of the race. Both making the tough, but wise decision to save their legs for better days to come. Kevin remained and paced his way to a very even 31:45. This was good for a PR as it was his first-ever track 10k. The team finished their evening at Hoagie Haven (much hyped by Dylan). Orders ranged from The Sanchez (Chicken Cutlet, American Cheese, Mozzarella Sticks, Fries, and Sanchez sauce), Mac Daddy (Bacon Cheeseburger Hoagie, Mac n Cheese Wedges, Fries, Honey Mustard, and Hot Sauce), and the milder Eggplant Parmigiana. Colin McGrath and Pat McLaughlin joined the crew after providing valuable cheering support at the track. Washington D.C.: Cherry Blossoms were in full bloom for the annual Cherry Blossom 10 Miler. Ivan Runchkin had a stellar race entering with a goal of running under 58 minutes. He instead broke 57 minutes for 115th. An excellent surprise. Congrats, Ivan! 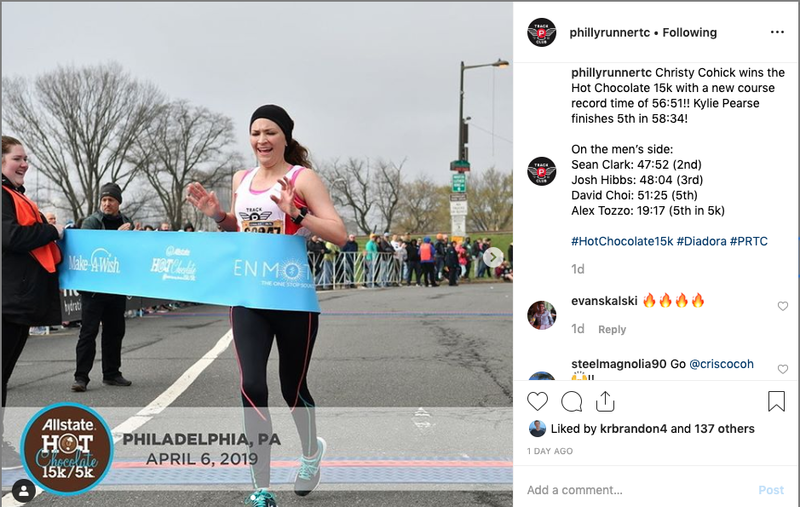 Philadelphia, PA: Sunday also featured the Wharton 5k at Penn. This race raises money for "Minding Your Mind" which, "aims to reduce the stigma and destructive behaviors often associated with mental health issues by educating teens, young adults, and school administrators." Austin Zimmet's 16:59 earned him 4th overall while Abby Cember's 17:16 was good for the overall win!